SUDDEN FAME: Race AQHA SI-98 AAA 28-8-3-2 $ 21.110. BAR DEARIE: AAA-90, por Lake Erie-TB, 5 vitórias, U$17,526, 1º Zia H. Mãe de:* BRAZEN BRITCHES, AAAT-101, por Timeto Thinkrich. CORONA CARTEL: SI 97 (1994). Stakes winner of $557,142 [G1]. Sire of 628 ROM, 97 stakes winners, $27,175,008, including BLUES GIRL TOO SI 105 (world champion, $2,032,328 [G1]), TELLER CARTEL SI 108 (champion 2-year-old colt, $1,212,471 [G1]), CARTERS CARTEL SI 103 (champion 2-year-old colt, $659,146 [G1]). Sire of the dams of stakes winners GALLANT WAYS SI 100, CHECK ON CHICO SI 106, JESS SASS ME SI 107. FIRST DOWN DASH: AAAT-105, Campeão Mundial, ganhador clássico com 13 vits. e mais de US$ 800 mil em prêmios. Venceu nos: “Dash For Cash Futurity”, “Champion Of Campions” e “Kindergarten Futurity”, todos G1. É o garanhão número 1 de todos os tempos dos EUA, com 1417 ROM, sendo 131 Superior Race Award, 57 Champions, 4 World Champions, mais de US$ 74 milhões em premios, com destaque para : OCEAN RUNAWAY (AAAT-105, 10 vitórias, $1,642,498, Champion (3 vezes), 1º Los Alamitos Million Futurity-G1, 1º Golden State Million Futurity-G1, 1º Champion of Champions-G1, 1º Governor’s Cup Futurity-G1, etc. ), NO SECRETS HERE (AAAT-104, 6 vitórias, $1,637,095, High Money Earning Horse, 1º All American Futurity-G1, 1º Z Wayne Griffin Director’s S., etc. ), CORONA CASH (AAAT-101, 19 vitórias, $1,542,880 , Champion (3 vezes), 1º All American Futurity-G1, 1º Los Alamitos Derby-G1, 1º Ed Burke Memorial Futurity-G1, 1º Governor’s Cup Futurity-G1, etc. ), CORONA KOOL (AAAT-104, 14 vitórias, $ 1,296,797, Champion (2 vezes), 1º Los Alamitos Million Futurity-G1, 1º Ed Burke Memorial Futurity-G1, 1º Los Alamitos Derby-G1, 1º Los Alamitos Invitational Championship-G1, etc. ), FALLING IN LOVEAGAIN (AAAT-108, 9 vitórias, $ 1,210,375 , 1º All American Futurity-G1, 1º Red Earth H-G3, etc. ), FDD DYNASTY (AAAT-102, 8 vitórias, $ 1,173,001 , Champion (2 vezes), 1º Ed Burke Million Futurity-G1, 1º Go Man Go H.-G1, 1º Governor’s Cup Derby-G2, 2º Los Alamitos Two Million Futurity-G1, etc. ), A RANSOM (AAAT-104, 21 vitórias, $ 1,079,556 , World Champion, 1º Champion of Champions-G1, 1º The Championship At Sunland Park-G1, 1º Los Alamitos Invitational Championship-G1, 1º Los Alamitos Invitational Championship-G1, etc. 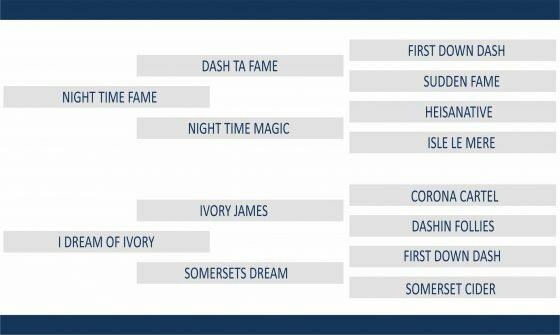 ), A CLASSIC DASH (AAA-93, 7 vitórias, $ 1,078,617 , Champion (2 vezes), 1º All American Futurity-G1, 1º Dash for Cash Futurity-G1, etc. ), DASH THRU TRAFFIC (AAA-95, 6 vitórias, $ 1,056,943 , Champion, 1º All American Futurity-G1, 3º Rainbow Futurity-G1, etc. ), ROYAL QUICK DASH (AAAT-101, 7 vitórias, $ 1,046,980 , Champion , 1º All American Futurity-G1, etc), etc. FIRST PRIZE ROSE: AAA-98, por Gallant Jet. 6 vitórias, $ 22,754, 2° Three Bars H., etc. Irmã própria de Dashin Rosie (Avó de BLUES GIRL TOO AAAT-102, World Champion, $2,032,328 [G1]). Mãe de :* FIRST DOWN DASH AAAT-105 (Dash For Cash). World Champion, $ 857,256 em prêmios, 1° Dash For Cash Fut-G1, Champions Of Champions-G1, Kindergarten Futurity-G1, etc. Maior Reprodutor em somas ganhas da história do Quarto de MIlha, com filhos que ganharam mais de US$ 74 milhões. * FIRST A ROSE AAAT-101 (Mr Master Bug). 4 vitórias, $ 31,926, QHBC Sophomore Classic-G2, 3° QHBC Sunbelt Derby [R], etc. * First Prize Dash AAAT-101 (Dash For Cash). Broodmare of the Year; 5 vitórias, $ 77,465, finalista [G1]. Mãe de FIRST CAROLINA AAAT-106 ($415,047 [G1]), FIRST PRIZE LEESA AAAT-106 ($364,852 [G1]), FIRST PRIZE ROBIN AAAT-103 ($295,147 [G1]), FAST FIRST PRIZE AAAT-102 ($244,929 [G1]), HEZA FAST DASH AAAT-103 ($136,123 [G2]), etc. KIPTYS CHARGE: (1976), AAAT-106, ganhador clássico com 9 vitórias aos 3 anos, incluindo `Pomona Futurity` com U$320 mil em prêmios. Pai de 168 ROM, sendo 12 ganhadores clássicos com prêmios superiores a U$2 milhões, inclusive: KIPSCASH (AAAT-105, 14 vits., inclusive G1), TAKE THE RISK (AAAT, 8 vits, inclusive G2), etc. * LEVIS N LACE, AAA-98, por Tiny`s Gay, 7 vitórias, $27,475, 1º Cow Capital Turf Club Fut., Old West Racing Assn, D., 2º Denver Fut-G3, Dan Lockie Derby. Produziu:** Power Move, AA-89, 9 vitórias, $1,809* Fame At Last, AAA-95, por Tiny`s Gay, 7 vitórias $24,522, 3º Ruidoso 550 Champ* Loves Folly, AAAT-105, 6 vits., $35,009, produziu:** Follys Last Love, AA-86, 4 vits., $17,609, 3º Longhorn Fut.G-3** Chief Choo Choo, AAA-93, 6 vits., $17,114** My Daddys Free, AAA-94, 3 vits., $11,687 (Finalista Manor D-G3)* Sudden Fame, AAA-98, por Tiny`s Gay, 8 vits., $21,110. Produziu:* DASH FAME, AAAT-113, 7 vits., $290,812, 1º Golden State Fut.-G1, El Primero del Ano Derby-G1, 2º Dash For Cash Fut.-G2, etc** WIN FAME, AAA-97, 3 vits.$15,303, 1º Alamo City Fut. ** Fames Last Chance, AAAT-105, 5 vits., $21,033** Yawl Be Sudden, AA-88, ganhador* Privileges Available, AAA-94, por On A High, 2 vits., $7,881.